Kids these days don't know what they're missing. Tash and I went out a couple of days ago to go see The Muppets, starring Kermit the Frog, of course. 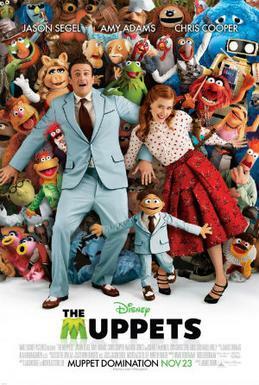 Jason Segel and Amy Adams are in it, too. That movie was such a blast. The premise is that an evil richman named Richman (who laughs by saying "maniacal laugh") has bought the Muppet Studios including the theater and all of the characters' names. He's going to drill for oil under the studios and foster an edgier cast called the Moopets. Waka waka. The only way the Muppets can stop this from happening is if they raise a million dollars. The whole project is spear-headed by a character named Walter. He's the muppet brother to Gary (Jason Segel). Gary has been dating Mary (Amy Adams) for ten years. They decide to go to California because it's an anniversary trip. They bring Walter with them as Gary knows it's Walter's dream to meet the Muppets. There is so much singing and dancing in this movie. I couldn't help but sway in time to the music. It's over-the-top at times but cheeky as there are a couple of times in the movie where the characters address the fact that there is an audience watching them. Another thing this movie had lots of were cameos. I disliked the appearance of Selina Gomez but she spoke the truth. She said she has no idea who the Muppets are, she's just appearing because her agent told her to. I can't recall seeing any children in the theater with us. It was all adults reliving their youth. My favorite cameo was Jim Parsons who plays Sheldon in the Big Bang Theory. He was a part of the number "Man or muppet?" I loved all the songs in the movie. Sad thing though is that once the last song came on, I couldn't recall any of the lyrics from the previous songs. The rest of the night I was singing "Mahna mahna. Doo dooo doo doo do." There were so many awesome things about the movie. I barely covered them. Best thing is for you to go out and see it yourself. You'll be laughing, singing, dancing and having the best time. This movie gets five stars from me. Take a younger relative with you, while you're at it. Introduce them to the Muppets and then you can introduce them to the awesome Muppet Babies.